Optoisolator is the isolator used for optical communication. It is basically a passive and non-reciprocal device. 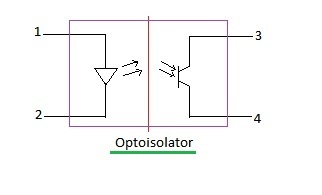 Opto-isolator passes light in only one direction and blocks light in the other direction. Figure 1 depicts simple schematic of opto-isolator consisting LED, dielectric barrier in between and phototransistor (sensor). Optical isolators are employed at the amplifier/laser output which helps prevent light reflections to enter these optical devices backwards. Hence it improves the performance of amplifier and other optical components. Basic parameters to be considered for selecting isolator are insertion loss and isolation. Insertion loss should be less and isolation should be high. Insertion loss is the loss in the forward direction for the light signal to pass though as desired. Isolation is the loss in the backward direction to block the light signal to prevent degrades the performance of preceding devices in the chain. Typically isolation will be in the order of 40 dB to 50 dB and insertion loss will be in the order of 1dB. Let us understand working of polarized type of isolator as shown in the figure-2. There are two modes of polarization based on electric field vector orientation with respect to the direction of light propagation. If the vector is perpendicular to the direction it is referred as vertical SOP (State Of Polarization) of the light. Let us assume as shown in the figure, that incoming light signal has vertical SOP and polarizer passes light only having vertical SOP and blocks the light having horizontal SOP. The rotator in the middle rotates the light signal by 45 degree clockwise irrespective to the input signal direction. Polarizer on the right passes the light signal with 45 degree of orientation and hence light signal will be passed from left to the right without much of attenuation. The light entering from right towards left is shifted by 45 degree and hence will have horizontal SOP which is blocked by polarizer on the left as it passes only vertical SOP. As we do not have control over SOP of the input light signal this type of isolator is not suitable. For this purpose polarization independent isolator has been designed. The same is depicted in the figure-3. First the signal will be passed from SWP (Spatial Walk-off Polarizer) made of two birefringent crystals having two different refractive indexes. When light signal having random SOP is applied as input to these crystals two orthogonal components are refracted having two different angles. These two light components go through rotator and half wave plate with each providing 45 degree drift. Remember that half wave plate provides 45 degree phase shift in clockwise direction for the signal travelling from left to the right but in anticlockwise direction for the signal from right to the left. This results into total drift of 90 degree from left to right. Hence combination of faraday rotator along with half wave plate converts vertical polarization into horizontal polarization and vice versa. In the reverse direction i.e. from right to the left, SOP of the light signal will not change as rotator and half wave plate cancel the phase change introduced by each other as one introduces phase shift in clockwise and the other in anticlockwise direction. Typical specifications of polarization insensitive isolator are summarized below.